The All-encompassing Treasury of Knowledge (Tib. ཤེས་བྱ་ཀུན་ཁྱབ་མཛོད་, Sheja Kun La Khyabpé Dzö, Wyl. shes bya kun khyab mdzod or simply Sheja Dzö) — an encyclopedia of Buddhist wisdom and knowledge. 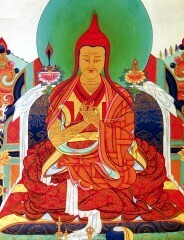 One of The Five Great Treasures of Jamgön Kongtrul the Great. Part One: What Are the Sacred Teachings? This page was last edited on 18 March 2018, at 02:01.